Portland is a city with a real DIY ethos at its heart, as well as one of the few West Coast cities left that hasn’t abandoned the notion of nomadic thrift reappropriation and given over completely to the model of the ‘vintage’ clothing boutique. 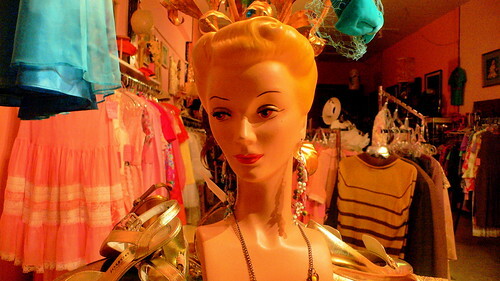 The major difference between these two modes, of course, is the question of who gets to choose your style for you, as well as — in the case of the vintage clothing boutique — a kind of enforcement of style categories that is based more on connoisseurship and less on the kind of anarchic reterritorialization that can take place while thrift shopping. I love the notion that a winter coat with a fake fur collar that once would have been quite at home on a Nixon wife can be ripped so far out of context that it becomes the favorite jacket for a couple of riot dykes with cat-eye glasses and tattoos of their mothers on their arms. Speaking of reterritorialization, I recently discovered that my close friends Geoff and Jacqui had relocated to Tacoma, Washington and would be visiting Portland while I was there. I’ve known Geoff, aka Geoffrey Cain, since we were at Sonoma State University together. 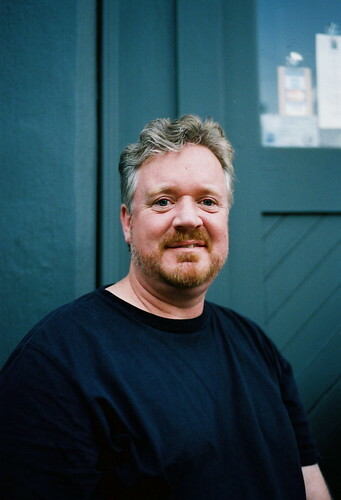 Geoff is a poet and novelist and he tends to write in an idiom that is partially post-Beat, partially visionary, partially skewered bubblegum wrapper philosophy, and often deeply centered in locale. Big Sur seems to be the center of gravity for much of Geoff’s writing, which makes sense since he grew up in California’s central coast region and often spends days camping in mountain ranges that lunge straight down into the ocean. Geoff and Jacqui got married in Halcyon, California, at The Temple of the People, a Theosophist temple that has walls lined with a series of paintings that illustrate the entirety of Longfellow’s Hiawatha. When they walked down the aisle, if I remember correctly, it was to the tune of “The Entry of the Gods Into Valhalla,” a rousing number from Wagner’s Ring Cycle. And don’t forget to check out Geoff’s novel, The Wards of St. Dymphna. The last time I was in Portland was for the wedding of my old friend Jon Legare and his wife, Ellie. Jon and Ellie, who is a midwife, had their wedding in Portland shortly after having moved to Oregon from Petaluma. One of the first places that Jon found was Dots, a half bar, half restaurant that has walls that are coated with textured velvet wallpaper, scrounged 50s modern chic, kitsch matador paintings, and various coagulations of reconstituted anticulture. The vibe is definitely punk rock, though perhaps the emphasis is more on a rocker-tattoo sensibility than on a pure punk blowout. In any case, Geoff, Jacqui, Jon, Jess, Lea, and myself all ended up meeting back at Dots for some burgers and Pabst, which is the low-rent beer par extraordinaire (“Union Made In The U.S.A.”). What I really like about Dots, and about Portland in general, is the great sense of urban anti-cosmopolitanism that you can find at work here. Unlike highly capitalized cities like San Francisco and New York (not to mention Tokyo) that are centered around an international hub of sophisticated design concepts, Portland’s urban moxie rises from a cultural base that gets its nutrients from locality (Oakland is a bit similar in this respect). While you might lose some ultimate sense of cultivation or sleekness, at least you don’t have to bow under the oppression of yet another “me too” Gehry erection (and this comes from a person who thinks that Gehry was one of the more important architects of the 20th century). Jon too has always had a sense of the importance of locality. As a very rare fourth-generation Petaluman, Jon had a sense of rootedness that all his imported friends (myself included) couldn’t share. Of course, he’s a first generation Portlandian now, but he’s spent his years there getting rooted in his neighborhood. The fact that Ellie is a midwife helps as well, since nothing includes you in community faster than delivering other peoples’ babies. In any case, Jon — who always was a kind of café maven — has decided to go all-out in terms of putting down roots by opening a combination community resource/information center and café. It’s a small place, but in a nice neighborhoody location. Jon was still working on putting it all together when we arrived and it was nice to see the space in process and get some kind of idea of what it would be like in completion. The Legare’s blog can be found here, and you can check out Ellie’s homepage if you’re living in the Oregon area and thinking about hiring a midwife. 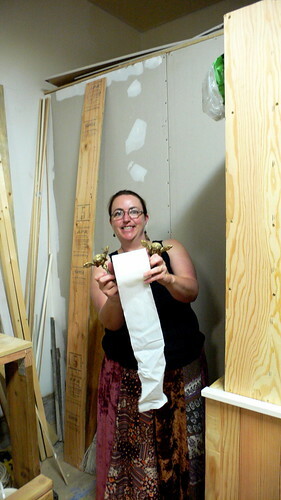 Here’s Jacqui holding up the “lil’ angel” toilet paper dispenser that she was insisting Jon keep as part of the café decor. 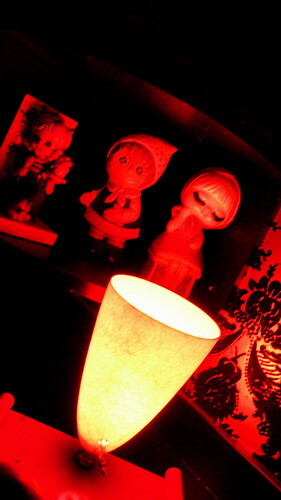 Jon refused absolutely, of course (oh, poor lil’ angels!). You can read Jacqui’s blog here. 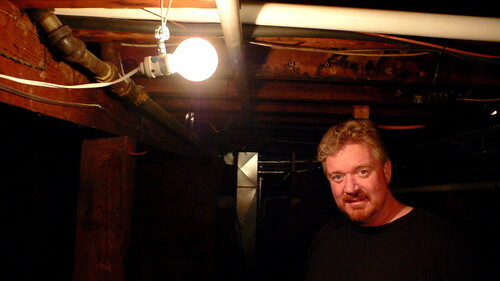 Jon also gave us a tour of the basement, all dark and dismal and interesting. 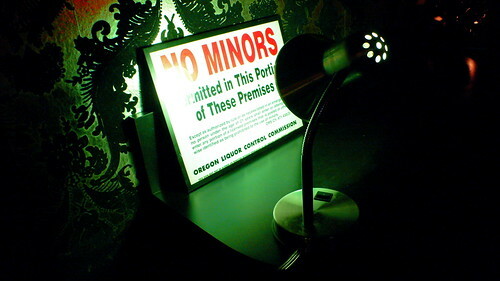 Basements always give Geoff bright ideas, and in fact, Geoff and Jacqui were responsible for several issues of a very bright literary zine called Notes From the Underground that they published in the 80s. I think the last time I saw an issue was at Bound Together Books, the Anarchist bookstore on Haight Street in SF. And speaking of Anarchism, no Legare endeavor would be worth its salt without some. Jon’s DIY motorcycle collective in Petaluma — Dungeon Motors — was full of the stuff. 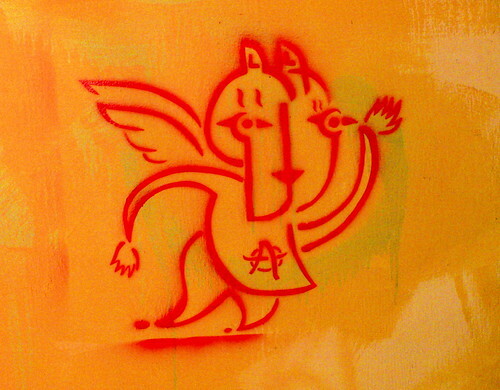 I find the spray-art Anarchist angel pictured above to be the perfect omen for Café Legare — a piece of personal and idiosyncratic political expression letting itself be known in the world. Yay! Congratulations to Jon and Ellie!!!! !